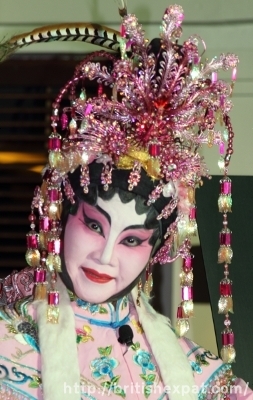 Here’s a photo I took of an elaborately adorned Cantonese opera singer from Singapore’s Chinese Theatre Circle performing to entertain the guests at the luxurious The Pavilions resort in Phuket. Apparently it takes the opera performers two-and-a-half hours to put on their make-up and costumes. And all that for maybe a fifteen-minute performance. We were visiting The Pavilions, Phuket to experience their Passions programme. I wrote a feature about it for ALuxuryTravelBlog.com, and you can read more on there about the wonderful time we had. Actually, I’m lucky to be able to publish this photo at all as I was “enjoying” myself so much I managed to lose my camera. Most likely, I left it lying around somewhere, and then went back to our villa. Tsk. Luckily one of The Pavilions’ excellent staff found it and kept it in a safe place until the following day when it was handed back to me intact. If I’d lost my camera anywhere else I would probably have freaked out, but The Pavilions is such a safe and relaxed environment I just knew that everything would be OK. This entry was posted	on Thursday 20 October 2011 at 03:47	and is filed under 2011. You can follow any responses to this entry through the RSS 2.0 feed. You can leave a response, or trackback from your own site. I always worry about leaving my camera behind somewhere. Not so much for the camera (although expensive, I guess it’s replaceable) but as much for the pictures that are on it at the time. Yes, I doubt if I’d ever have a chance again to get photos of these opera singers. I only realised I’d lost the camera the next morning when I was ready to set out. Erm, where’s my camera? You know that sinking feeling you get when you lose something? But I didn’t feel too bad. I said that I didn’t believe that any of the lovely staff would steal it nor any of the other guests, so it must have been found and put in a safe place waiting for someone to claim it. Dave was amazed that I was so calm about it. (Nearly £1,000 worth of kit left lying on a table.) I really never doubted for a minute that I’d get it back. And, sure enough, at lunch the following day one of the staff brought it to the table asking if it was mine. Whew! I won’t do that again! Needless to say, my insurer refused to cover the loss.